Partially in response to the history being presented to the public, Militant decided to hold meetings to explain our consistent approach to the developments here. Whatis interesting about both these meetings is that they were held in Derry in 1988-1989 with Peter Hadden and Gerry Lynch speaking. Gerry is a member of the Socialist Party, having been involved with us since 1968 when he was in Derry Labour Party. 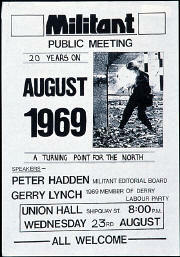 Peter Hadden has been a leading member of the SP in Northern Ireland since the early 1970's. 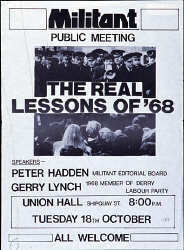 If you can get them, Militant/the Socialist Party have produced pamphlets of our historical articles from 1968-69. These are well worth reading to see how Marxists approach difficult events and these pamphlets will be carried on our web site in the next few months. We are the only Left political group which CAN REPRODUCE our statements from that period without fear of being exposed as having changed our position.